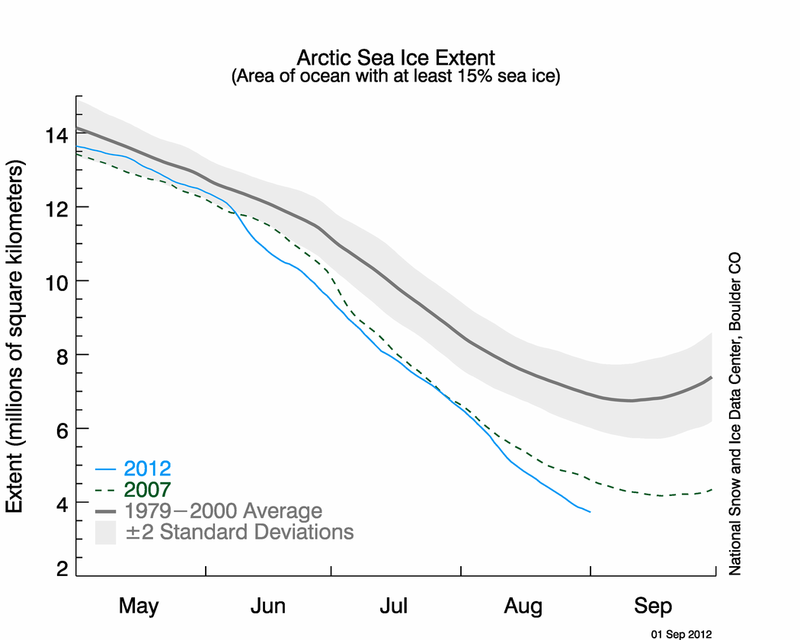 Musings of a Durotrigan: Winter 2012-2013 Weather Forecast: will Arctic Sea Ice Cover play a Role? 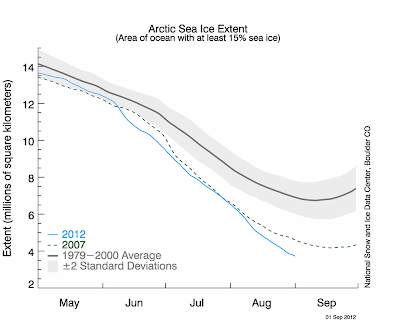 Winter 2012-2013 Weather Forecast: will Arctic Sea Ice Cover play a Role? Arctic Sea Ice: a new record Minimum? As anticipated, although a couple of weeks ahead of the projected date, we have this week been notified that satellite data show Arctic sea ice to be at its lowest extent since such measurements began to be taken in 1979. The melt season does not normally finish until the middle of September, so it is likely that this cover will shrink still further over the coming fortnight to three weeks, surpassing by far the previous record minimum observed in the summer season of 2007. 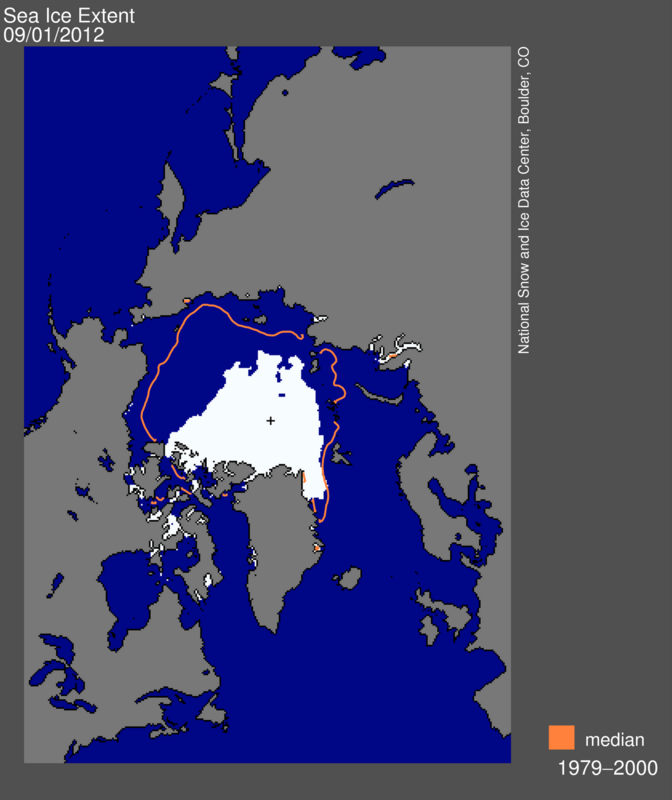 Then, some were claiming that the Arctic Ocean could be completely ice free by the summer of 2013, but the failure of the summer melt to replicate the conditions of 2007 – until this summer that is – caused most scientists to revert to more cautious estimates of a complete annual melt at some point in the 2030s to 2040s. These observations and claims have created not only headlines, but also a degree or two of heated controversy, with these measurements being used in the political arena by a variety of advocacy groups and individuals with their own particular axes to grind, whether these be anti-Western anti-modernist Greens, or oil industry lobbyists and ‘sceptics’. This is unfortunate, for neither seeks to use the science in a dispassionate way, instead focusing upon cherry picking data that best fit their respective narratives. It is against this backdrop that some are trumpeting these measurements as being consonant with the catastrophic anthropogenic global warming hypothesis, whereas others are rubbishing the data and claiming either that such conditions are not historically unusual, or that we simply lack reliable data for comparative purposes. Whilst true that satellite measurements are of only recent provenance, earlier records from submarines and surface ships are available, providing a good indication as to the extent and thickness of the Arctic sea ice back into the 1950s. These confirm not only that the ice has decreased markedly in extent since then, but also in thickness, with some estimates suggesting that the summer sea ice has lost two thirds of its volume over the period in question. The first of the graphics below shows the extent of ice at the time of writing, together with the line indicating the 30-year average for this time of year. 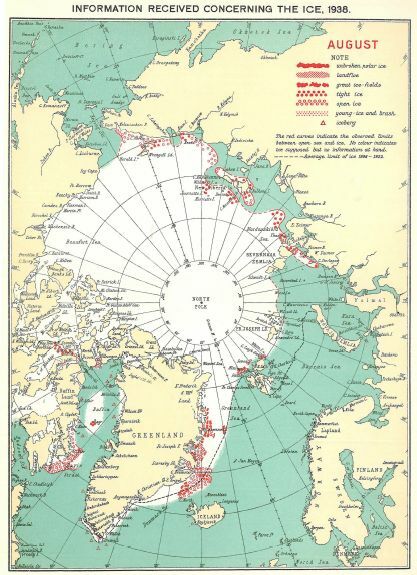 Below that, is a map showing August sea ice recorded in 1938, which clearly indicates its much greater extent compared to today. Earlier than this, we have a rather indistinct idea of what constituted the normal limits of the ice, but a research project is currently underway, analysing thousands of observations recorded in the logs of nineteenth-century whaling vessels in order to gain a better understanding of the climatological norm during that period. What is beyond dispute, is the fact that sea ice has a high albedo, whereas open ocean does not: snow-covered sea ice with small water gaps between the floes typically reflects approximately 85% of the solar radiation that strikes it, whereas open ocean reflects only circa 3%. The unusually high loss of Arctic sea ice this year will therefore have significant implications for the amount of solar energy absorbed by the Arctic Ocean. Warming or a ‘New Little Ice Age’? Piers Corbyn is at present the most well known advocate of the ‘New Little Ice Age’ (NLIA) hypothesis, with him repeatedly claiming that owing to a lull in solar radiative output akin to the Dalton or Maunder minimums, we, at least in the UK and north-western Europe, are about to experience decades of cold winters and cool summers. This, he claims, is associated with shifts in the jet stream occasioned by solar changes, the explanatory mechanism of which he has declined to submit to peer review, ostensibly for commercial reasons. If indeed it is the case that reduced solar output is associated with cooling in these areas of the globe – as seems to be suggested by historical records – then it seems odd that the ice of the northern hemisphere should today be at such a low extent. After all, the onset of the Little Ice Age was not associated with reduced ice extent, but a significant increase. The Greenland Norse for example lost contact with Europe as shipping lanes were cut by ice, presaging a gloomy extinction for the Scandinavian colony, whose marginal agriculture was unable to support the lives of its inhabitants who gradually fell victim to starvation and the arrival of the Inuit. Although some people mistakenly think that “Greenland” was named as such because it truly was “green” before the Little Ice Age, this is factually incorrect, the name having been bestowed upon the vast icy island by Eric the Red, in a bid to tempt colonists from Iceland and elsewhere in Scandinavia to venture westwards, and settle in his new colony. Iceland itself, although far more clement, found that its entire coastline was icebound during a number of winters as recently as the Eighteenth Century; in 1695, much of the coast was still surrounded by ice in July. If we are entering a new Little Ice Age as Corbyn claims, it seems distinctly odd that this passage into a new climatological regime should be accompanied by a widespread retreat of ice in the Arctic and the Alps. to unpredictable, often wild weather, marked by warm and very dry summers in the late 1320s and 1330s and by a notable increase in storminess and wind strengths in the English Channel and North Sea. The moist, mild westerlies that had nourished Europe throughout the Medieval Warm Period turned rapidly on and off . . . . The Little Ice Age had begun. (p. 44). Could we be about to witness such a switch, or are the parellels nothing more than coincidence against a very different climatic backdrop? Fagan's observations raise some interesting questions. Reduced Sea Ice: Cold Winters for the UK? Putting aside disputes over the genesis of recent low levels of Arctic sea ice, there have been some interesting suggestions that the retreat of ice in this part of the world, together with its associated warming, is having a significant impact upon climate, specifically, the position of the jet stream in the northern hemisphere. One theory contends that the reduced contrast in temperature between the northern polar region and the tropics arising from a warming Arctic results in a weaker and slower moving more southerly jet stream, which has a tendency to get stuck in a particular position for long periods of time; hence, our second wettest summer on record preceded by an exceptionally wet spring (discounting March of course). Elsewhere, such as in parts of the US and Russia, this pattern has led to exceptional heat and drought, rather than to rain and subdued temperatures. What this “sticking” of the jet stream implies for the coming winter is unclear, but if such a pattern should continue, rather than experiencing the normal run of mild Westerlies, the British Isles could once again experience something akin to the exceptional incursion of bitterly cold polar maritime air witnessed in late November and much of December 2010. This marked the beginning of the second consecutive unusually cold winter for the UK, although last year provided us with a break from this pattern. What will we see in 2012-2013? Whether the unusual disposition of the jet stream happens to be linked to reduced sea ice, ongoing low solar radiative output or a combination of both factors, will be a moot point amongst climatologists for some time yet. Last year, The Daily Express latched onto a winter forecast by James Madden, claiming that once again we would experience a bitterly cold winter, which of course, we did not. Piers Corbyn too made similar predictions relating to exceptional cold during the early part of the winter season that proved to be wildly inaccurate. Neither independent forecasters, to the best of my knowledge, have yet released their outlook for the winter of 2012-2013, but they will do soon enough, and it will be interesting to see how much credence papers such as the Express place upon their forecasts. Journalists, when it suits them, seem to have incredibly short memories, and have thus probably forgotten the major gaffes made by Madden and Corbyn in 2011. Is anyone capable of producing an accurate long-range forecast? At this stage in the development of meteorology, probably not. Is it worth a flutter on a white Christmas at the bookies? It probably is, from the perspective of William Hill, Betfred, etc. UPDATE: True to form, The Daily Express did indeed publish yet another story on 17 November this year claiming that we are about to experience the 'coldest winter in 100 years'. Really? Hmm. I may not be able to forecast the weather with any accuracy, but the content of the Daily Express is rather easier to predict. By the very end of November, the Daily Mail, The Independent and The Daily Telegraph had all jumped on this same bandwagon, with none of them providing any evidence in support of their 'coldest winter for 100 years' claim. Although the beginning of December proved to be cooler than average, it was far from exceptional, and the much vaunted 'Beast from the East' turned out to be little more than a mouse bringing a touch of frost here and there as well as the odd flurry of snow. It was feeble stuff which swiftly yielded to the depressingly familiar weather pattern that has bedevilled the UK since April 2012: wet westerlies.Piers Corbyn finally revealed his thoughts on the matter in, of all publications, The Daily Express, on 10 January 2013. I don't think we really know what is going to happen next. Many predicted a little ice age to start in the 1970s. Then we had 2 very hot summers on the trot 1975 and 1976. There is no prove in UK climatic history of wet summers carrying on and on. 1912 was a wetter summer than 2012 but the following year had changed to a warmer and drier pattern of weather. 1958 was very wet but 1959 had a glorious summer. It has been more than 6 years now since the last hot summer and we have come to a similar point in the cycle to that of 1982 in the 1980s when 1976 was the last hot summer. It can easily change to hot and dry in 2013 its done it before. You're right to draw attention to the fact that in the 1970s the theory that we were about to slip into another ice age was very much in vogue. Climatology is still in its infancy, but as the science matures, its accuracy will increase. I don't believe that anybody can, at this stage, give us an accurate forecast for the coming winter. It does seem that we are due another hot and dry summer, for it has been quite some time since we enjoyed one. As for successive runs of wet summers, I will be incorporating some material in the article above about the ruinous run of wet summers which began in 1315 and lasted until 1322. What did these summers presage? The end of the Mediaeval Warm Period and the beginning of the Little Ice Age. Good , well balanced article . I do think that there is definately change afoot . The interesting thing is what effect the Ice Melt will have .I actually go along with Madden in the short term as there is strong indications that we may have a colder ,wetter winter as opposed to last years winter which from my point of view in Dundee ,Scotland was mild and reasonably dry. I do think that there are plenty of interesting probabilities longer term .I do think the effects of global warming will continue and that the increase in sea levels /temperature will impact greatly on all our lives in the future ....but how ? I think that due to vested interests on both sides of the warmer v cooler arguments we wont actually know until its to late . This is a rather depressing prospect, but if it continues in this vein we could well be in for some rather wet and cold weather this winter. Measurements in Antarctica show the biggest increase in ice cover since records began in the 70's...'Global' warming? Pull the other one. I have checked the statistics and they do not demonstrate what you assert. Naturally, the dynamics of the Antarctic are completely different to those of the Arctic, given that the former is dominated by a large continental landmass, whereas the latter predominantly consists of ocean into which various currents flow. Very little of Antarctica, with the exception of the Antarctic Peninsula, experiences sustained temperatures above the freezing point of water, which cannot be said for the Arctic. Data relating to warming and cooling with respect to Antarctica as a whole are ambivalent, some areas - notably the Peninsula - displaying warming, and others cooling. What I have attempted to highlight in the article above are the uncertainties inherent within our current climatological paradigm, as well as pointing to possible alternative explanatory theories, whilst highlighting the discrepancies of some of these, for example, as forwarded by Piers Corbyn. I make no claim to be a meteorologist or indeed a climatologist, but one thing I am certain of is this: neither are you. Certainty is the province of belief, and scepticism that of science. "What this “sticking” of the jet stream implies for the coming winter is unclear, but if such a pattern should continue, rather than experiencing the normal run of mild Westerlies, the British Isles could once again experience something akin to the exceptional incursion of bitterly cold polar maritime air witnessed in late November and much of December 2010." I'm not sure why melting ice might cause colder winters in Europe? Is it that higher pressure over the Arctic (caused by less ice) will push the jet stream south of northern Europe therefore letting colder air in from the north and north east? Is that what is being suggest here? there is suggestion that the fresh water from the ice sheet has flowed into the north atlantic into the gulf stream the efect of this is to dilute the salty water of the gulf stream thus the efect would be to slow it down measurements have shown that this is happenning losing the warming effect would  as stated cause northern europe to lose benifits on warmth sea temps this inturn would force jet stream on a further southly track  see answer above? Better wait it out in a library with a fireplace handy then? Since the Drift used to flow into the arctic sea, has the decreased flow around the arctic alowed the continual sun's exposure to melt the ice more effectively? So NOAA say there is far more arctic ice than 2007, so the giant melt down was wrong. Did i laugh. . . need not have written the previous post.